God Complex will feature twelve of the Greek Gods of Mount Olympus singing you their greatest hits. This album will be different from past albums in that I will be releasing one song at a time. In addition to this, I will also be releasing a video series that will give a behind the scenes look at the album’s creation. 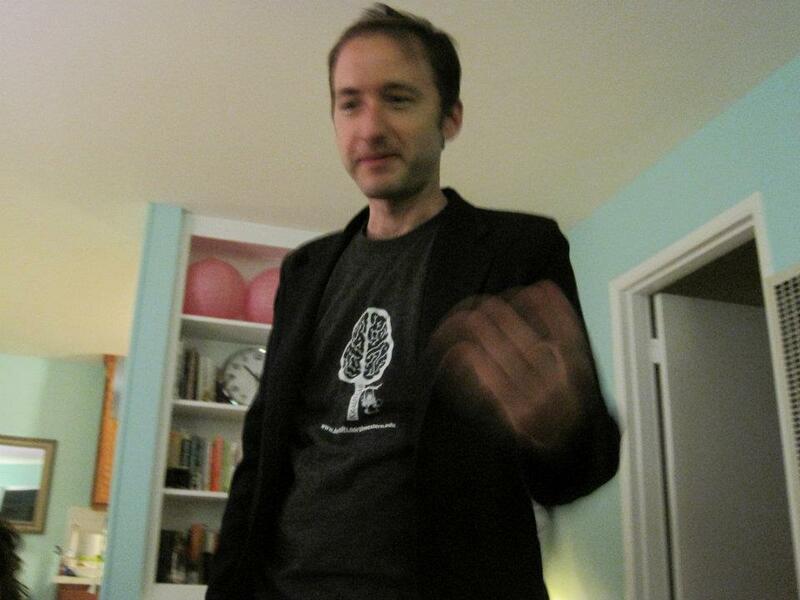 Rockin’ my Kraus Labs attire. Back in 2011, I briefly mentioned a project I was starting on with The Harmony Project and Northwestern University regarding the impact of music instruction on the brain. In addition to coordinating the study, I was also the primary music teacher for almost all of the 40-something kids involved. The scientists measured various brain and speech recognition functions of the students before and after my music classes. At the time I was optimistic that the results could get some press but I didn’t really think it would go beyond the academic and neuroscience community. In the last month, I’ve come across articles from The BBC, NPR, Huffington Post, PBS, ABC, Science News and many more about the study. It seems like every other day yet another article appears which highlights the findings of the scientists which has been reminiscent of the press flurry back when “It’s Your Birthday” dropped. One of my favorite things I’ve come across is a before and after gif that shows the brain development that took place over the course of the two years. Pretty amazing stuff. I am forever grateful to the Harmony Project and Kraus Labs for this opportunity. There are so many teachers out there that would love to have this kind of rich data on the impact of their classroom instruction. I feel so lucky to have been selected. More importantly, I hope that this study helps to fund other programs that offer music instruction to those students that wouldn’t otherwise have the ability to afford it.